Spinal disks are soft, rubbery spheres that cushion the vertebrae or back bones. They serve as “shock absorbers” for the spine. Disks have a hard exterior “shell” that protects a gel-like center. When something damages a disk, the soft interior material may bulge or leak through a crack in the exterior. 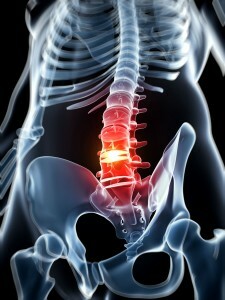 Many people seek herniated disk treatment for the back pain caused by this condition. A herniated disk is sometimes known as a slipped disk or ruptured disk. Spinal disk damage can irritate the nerves and cause pain or numbness in the back, arms and legs. Some people, however, live with the damage without experiencing any symptoms. The human spine or backbone is composed of vertebrae stacked atop each other. Soft disks are situated between the vertebrae. These disks act as a cushion and keep the vertebrae in the proper position while still allowing movement. Sometimes the disks herniate or bulge out of position. The herniated disk may then press on nerves or other structures causing pain, weakness, or numbness and tingling. Disk herniation’s are commonly experienced in middle age and are more common in people who frequently engage in heavy work. A doctor may diagnose a herniated disk through a physical exam. Depending on the symptoms, a doctor may also order other tests like x-rays, an MRI or CT scan, and nerve studies. Many people are able to experience improvement of their symptoms with only conservative treatment. Conservative treatment can include rest, avoiding positions that aggravate symptoms, and not lifting or performing heavy work for a period of time. Initial treatment may also include pain medication, muscle relaxants, and anti-inflammatory medicine. Oral steroids or Non-Steroidal Anti-Inflammatory Drugs (NSAIDs) may also be prescribed if symptoms persist. These anti-inflammatory medications can help to reduce inflammation around the nerves. Oral steroids are usually administered in a short course, but NSAIDs can be used for long-term treatment of symptoms if necessary. Epidural corticosteroid injections can help many patients experience relief. These injections are performed using spinal imaging to inject steroids in the area around the affected nerves. The steroids can improve symptoms by reducing inflammation. Some patients experience relief that can last for months. These steroid injections may be done as many as three times per year. Chiropractic or osteopathic manipulations may be beneficial for some patients. These treatments may reduce pain or other symptoms and allow the patient to return to normal activities. Physical therapy may also be beneficial for some patients. Working with a physical therapist allows the patient to learn exercises and positions that can relieve symptoms. Physical therapy can also help to strengthen any weak muscles to protect the back against additional injury. Surgery is the final option for a herniated disk. Typically surgery is only considered after other treatment options have failed. A discectomy involves removing the part of the disk that has herniated or bulged out of position. Many times a micro-discectomy surgery can be performed which is less invasive than an open discectomy. The entire disk may be removed during surgery or only part of the disk may be removed. When the entire disk is removed the surgeon may fuse the vertebrae together to stabilize the spine or insert an artificial disk. Herniated disk treatment may involve a variety of options. Physicians will usually try the conservative options first, then progress to other treatments if the conservative treatments do not work. Many patients will experience relief of symptoms with just rest and conservative treatment.